Recess Aides have a tough job that’s often thankless. 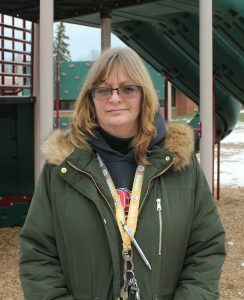 But Mitzi Thornton knows nearly every kid at Linden Elementary School—and she gets rewarded in hugs. A recess aide does more than watch the playground, right? Oh, yes. You have to keep an eye out for fights or bloody noses. Name calling. The kids fall; they break bones. Or if they’re having a crisis at home, they sit off by themselves. They cry. You have to see if they’re having emotion that’s not normal for them to know what’s going on. What’s it like when a child breaks a bone during recess? This year we had a kid playing on this curly pole that they scoot down with their feet, and he slipped and fell off. When he landed, from his shoulder to his elbow was straight, but from his elbow to his hand was like an A. So I got him to stay calm. I didn’t try to move his arm; I just kept talking to him. I told him it was going to be okay, we’ll get him fixed, and he’ll be all right. How do you handle a child who’s sad? We have a buddy bench. If you don’t have anybody to play with, you sit on the buddy bench, and someone will come play. Or if there’s someone sitting there, I’ll go see why and help them find someone. Or we have kids who have lost siblings or parents. If they get sad, or missing that person, I take them in the office and we get colored paper and make a little book. I tell them to make a picture or write something they want to tell that person they’re missing. And it helps. But somehow you have to walk the line between caring and discipline. How do you do that? I play with the kids. We build snow forts. I’ll go down the slides with them. I’ll swing with them. I chase them. They chase me. We draw on the sidewalk with chalk. But the kids know when the tone of my voice changes, it’s time to straighten up and listen. They need to burn off their energy so they can concentrate in the classroom. It helps them calm down to get running, be silly, and de-stress. They can yell. They can scream. They can run. We let them play dodgeball, soccer, football, hopscotch. We have a Mileage Club that we do. They walk so many miles and then they get prizes and stuff for it. What kind of training do you have or want to do your job? We have CPR and first aid training, but some kids have issues we don’t know about. Emotional issues, or sensory issues. Sometimes we don’t know how to treat it when they have a meltdown. We had a student with emotional issues, and he was having a meltdown, and I didn’t know what to do. I said, “Are you hot lunch or cold lunch?” And he said he was cold lunch. I said, “Oh, what’d Mom pack for you?” So he started telling me about his lunch, and then he started getting wound up again. I said, “Do you have a cat or a dog at home?” And he said he had a dog, so we started talking about the dog and he settled down more. Then I looked at my watch and I said, “Well, I don’t know about you, but I’m hungry. Let’s go in.” Finally, he got up and came in. I like going outside and playing with the kids, but I love when they give me hugs. I don’t have the stigma that a teacher has. Kids will say, “Why don’t we have to call you Mrs. Thornton?” I just let them call me by my first name. I even have a couple of kids that call me Mom.